I’m delighted to have the opportunity to exhibit some more Brontomerus artwork. Once more, as with National Geographic and indeed the original life restoration in the paper, Matt and I had the opportunity to work with the artist, feeding back on an initial draft, to help get the final version as accurate as possible. Attached is my sketch of Brontomerus. 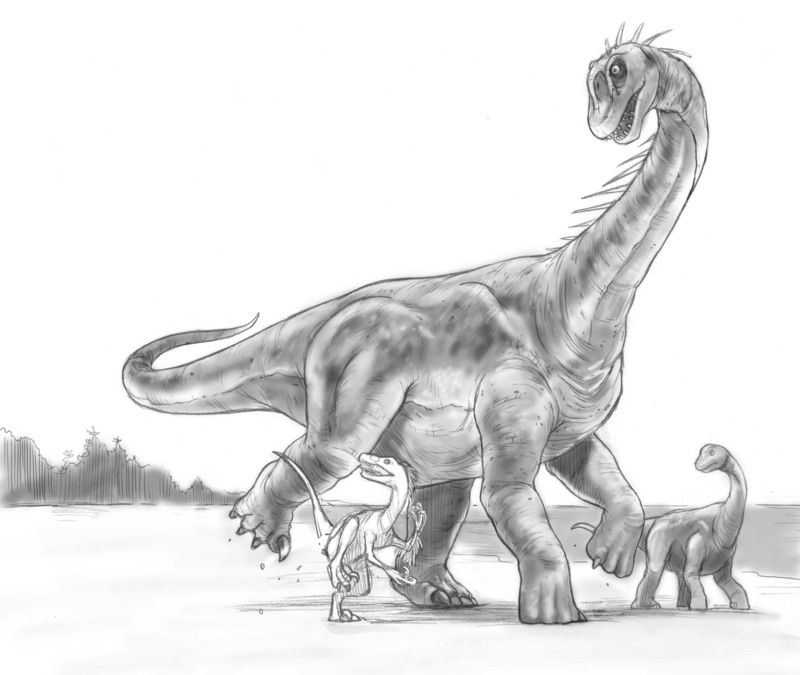 You’ll see some spines on my sketch; I understand that some similar sauropods had them. And it looks like paleontologists haven’t found any bones that would rule out these details. But I’ll be happy to lose them if you’d like. Also, I based my Brontomerus skull on the skeleton (fig. 1) in the PDF you provided. 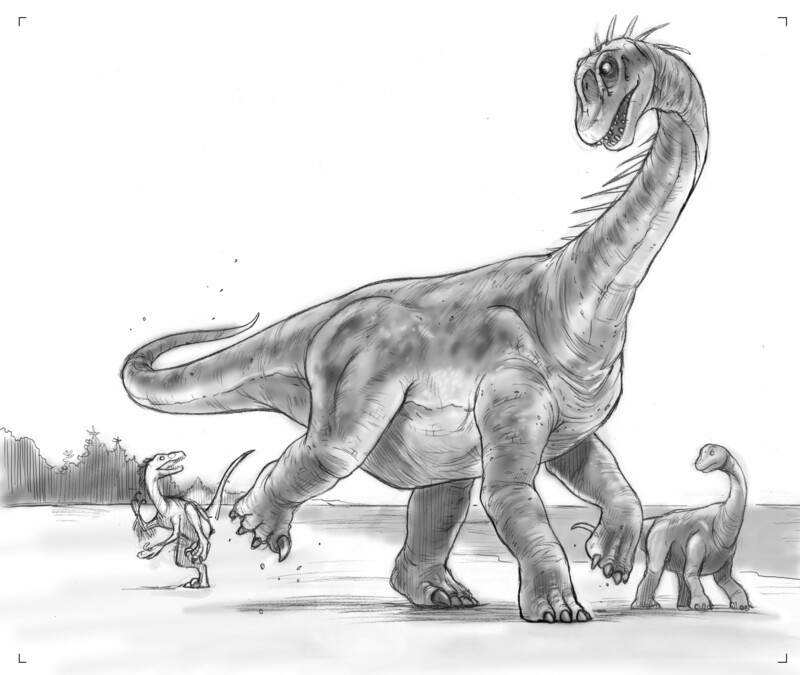 I aimed to make the head like that of the Camarasaurus, since the text says the two dinos were similar. The head in the illustration (fig. 12 ) looks like it’s based on a different dino – Apatosaurus. I’m sure your experts will set me straight. Hi, Andy, great to hear from you. It’s always a pleasure when our work is explained to the public, especially for kids. And I am especially delighted by the artwork. I don’t know if this statement really means anything, but it feels to me that it’s somehow captured the *spirit* of Brontomerus. I do have some criticisms, though! I am attaching an annotated copy of the artwork, which should help to clarify these comments. All my modifications are in red, so they should be easy to pick out. 1. Maybe most important — our speculation about Brontomerus‘s kick behaviour was to do with it kicking forward like a soccer player, not backwards like an ostrich. 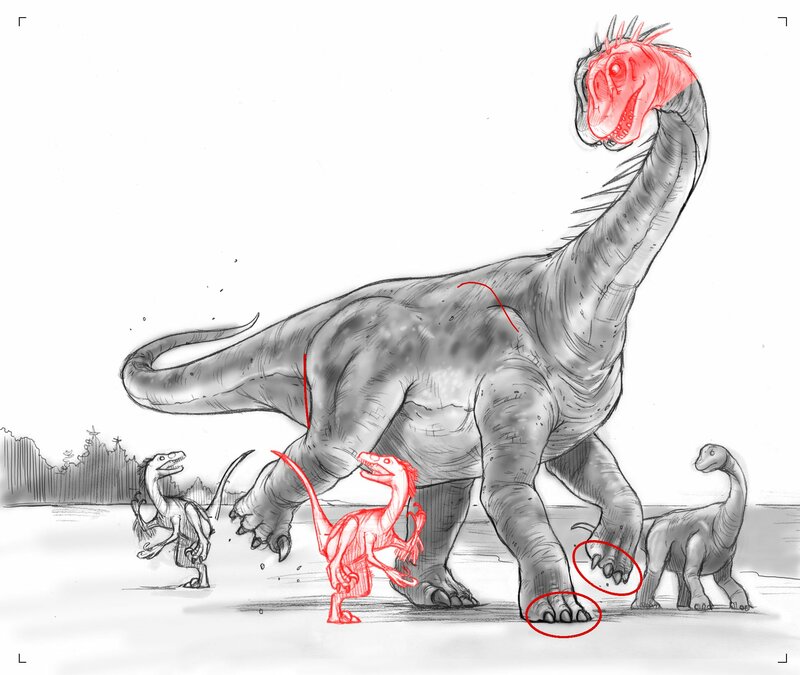 So to be in danger zone, the Utahraptor should be in front of Brontomerus‘s poised leg, not behind. The raptor should also be a bit bigger in comparison. 2. You’ve really captured the bulk of muscle on the front of the thigh well, but the back should probably be bulging slightly. 3. There is a distinct bulge on the side of the torso where the profile of the shoulder blade is visible. This is good, but it should be further up and further back. 4. The head is a little too big. In the annotated version, I’ve scaled it to 90% of its previous size, which looks roughly right to me. The spines are perfectly possible and rather handsome. I particularly like that the adult has them and the baby does not: these would likely have been sexual display structures, so it’s appropriate that they would develop only with increasing maturity. The head is excellent. You are quite right to base it on Camarasaurus rather than the very different skull of Apatosaurus. If I were to quibble, there is no reason to think that the regions between the bones would be very hollow, especially the one behind the eye. You’ll notice that the raptor has moved into the danger-zone, the rear of the thigh is more muscular, the scapular bulge has moved up and back, the head is slightly smaller and doesn’t have a visible indentation for the temporal fenestra, and the forfeet have lost all but their thumb claws. Finally, here is the coloured version as it will appear in the Magazine in April 2012: I like the bold splashes of orange. I’m really pleased to have permission from Highlights to exhibit both the pencil sketch and the final piece here, at high resolution. Please note that both versions are copyright Highlights. Many thanks to both Robert and Andy for being so responsive, helpful, and generous. Looking again at this, I am impressed by two things. 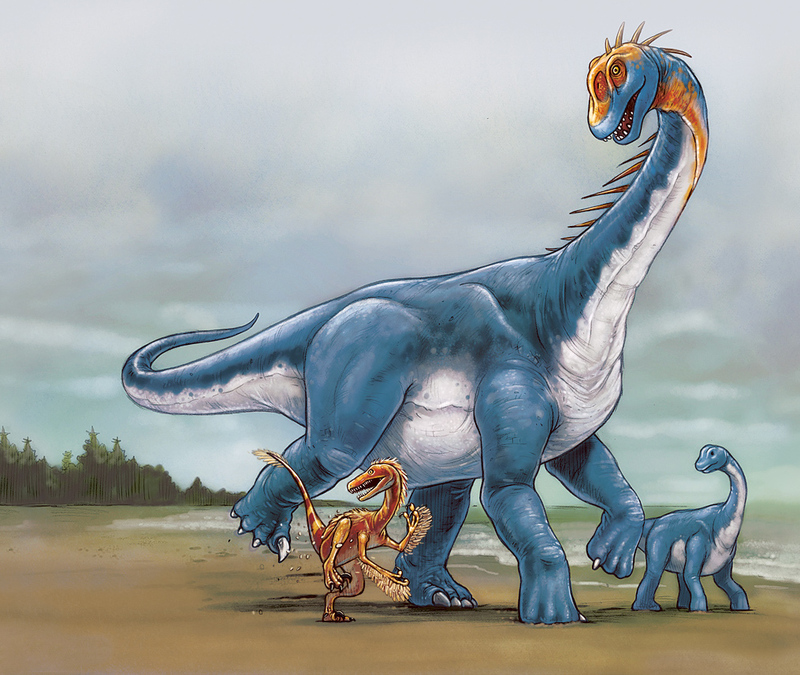 The first is just how far palaeoart has leapt ahead in recent decades, when even an illustration for a kids’ magazine is as anatomically careful as this — note details like the pronounced ventral bulge for the distal part of the pubis, and the distinctively camarasaurian head. We’ve come a long way from the old balloon-model sauropods. The second is related: it’s just great that the magazine took the trouble to contact scientists over this piece, and that artist was so obliging in responding to the issues we highlighted. It’s worth opening all four versions of the artwork in browser tabs, and switching between them to see how the piece changed from start to finish. All of this brings me to a point that I’ve wanted to make before, but which seems particularly relevant here. It’s very common for scientists in general, and palaeontologists in particular, to complain about their work being misrepresented in the media. I’m sure it happens — we all remember Matt’s awful experience with Clash of the Dinosaurs — but I think it’s much more the exception than the rule. In my own limited experience, I’ve found print journalists, artists and radio and TV people pretty much uniformly great to work with: genuinely interested, keen to get the details right, and willing to work with rather than against the scientist. I’m sure it helps that I take the time to prepare materials for journalists ahead of time rather than just expecting them to make do with the paper and the press-release [Xenoposeidon, neck posture, Brontomerus], but that’s not rocket science. Anyone who cares about getting their research reported right can do that. And media people want to do their job right. Ostriches kick backward? I was always under the impression they were forward kickers as well. Yeah, I realised as soon as I’d sent that message that it would have been clearer if I’d written “… like a horse”. But since that’s not what I said, I thought honestly required that I reproduce here what I actually did say. Mike, thank you for your kind comments about how children’s publishing has progressed. An important factor here was your willingness to take the time to be accurate and clear. Showing the corrections in red was a great help. I had never seen that done quite so well before, and it streamlined the process of getting the details right. A more common scenario involves a time-consuming (read: deadline-threatening) back-and-forth, with the illustrator doing a series of sketches, each one with incremental improvements, until we either (1) get it right or (2) run out of time or (3) wear out our welcome with the expert. I understand that scientists in all disciplines are under increasing pressure to write more papers, submit more grant applications, and still to do some science in between committee meetings. So your attention to this effort is much appreciated. Andy, I’ve had a few very bad experiences with the press (nothing major, luckily), and I have seen colleagues get shafted real bad. Now, something so bad that it is really hilarious happened to me. Given this background I am very pleasantly surprised by your actions, and glad to hear that the Brontomerus crew lucked out. I also had some very good press and artist experiences recently, and all I can say is: PLEASE keep up the good work! I proposed building a Brontomerus for a new exhibition we are developing but unfortunately the client declined to include this in the exhibit list. They asked for a pterosaur instead. (I know, I know!) I’m not giving up hope though. I hope that within the year I’ll be able to have Brontomerus join my dinosaur pack. Last year was the year for ceratopsians with Mojoceratops and Kosmoceratops making their debut in our exhibit list so I want 2012 to be the sauropods. Well, that would have been awesome! Do let us know if this should ever come about.